Recently I had an epiphany. Just like Jake Blues and Reverend Cleophus James in the Triple Rock Church, I saw the light. Jesus H. Tap-dancing Christ, I saw the light. After decades of deriding boutique motorcycles as slow, ill-handling, expensive garage furniture, I finally found one that all of the reason and experience in the world could not resist. We are talking genuine love at first sight here. Just like that moment you finally swore off high-maintenance hotties for the last time, and then the most beautiful woman you ever saw came strolling by in a black dress with a 10,000-watt smile. Ohh baby was I smitten. That's how I became the owner of a black and white, 90-degree desmodue, Marelli-injected, trellis-framed, Marchesini-shod, dry-clutch Monster S2R1000. Yep – that's how I became a Ducatista. Sorry if you thought that this was a tease for another well-known big twin, but even I have my standards. I've been riding motorcycles for a while and have sampled offerings from BMW, Honda, Yamaha, KTM, Husaberg, Husqvarna, Buell, Harley Davidson, Kawasaki, Ducati, Suzuki, Triumph, Aprilia, MV Agusta, Moto Guzzi and more. I always favored Japanese fours and parallel twins for their no-nonsense engineering and bulletproof reliability. In terms of pure engineering prowess, reliability and bang for the buck, it's a Honda-Yamaha world. Years ago, during a brief flirtation with road racing I rode the wheels off a Yamaha FZR400. The abuse that little bike took, pinging the rev-limiter in 120-degree temps, gearbox rowed like a galley slave, was nothing short of amazing. Even though the bodywork is now toast and the rear sub-frame is bent like a pretzel (as the result of an unfortunate racing get off) the Fizzer still starts right up. I get a little misty every time I walk by it in the shop. For many years I was a member of the Willow Springs Motorcycle Club, in Rosamond CA. Once during a race weekend we decided to take off early on Saturday and head into the hills near the track for a street bike ride. 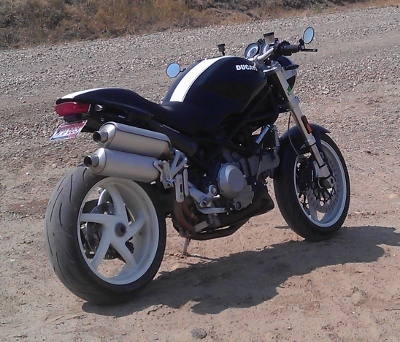 A buddy of mine had a beautiful Ducati 851 – the first modern Ducati Superbike. He rode my Honda 954 and I rode his Duc up Spud Canyon and through the hills above Santa Clarita and Aqua Dulce. The 851 was a revelation. I had never considered how a motorcycle that wasn't particularly fast and lacked laser-like focus on racing performance (by modern standards) could be a thing of beauty. I remember coming down out of the mountains right around sunset that evening and stopping beside the road in the high desert on Avenue D in Lancaster to watch the last of the sun. I think that the seeds of my eventual swoon were sown at that moment. Later I worked for a motorcycle magazine in Los Angeles and rode wonderful exotic motorcycles in various shootouts and performance evaluations. Hard corps stuff. I remember trying to sufficiently warm the rear tire of a Yamaha R1 for a quarter-mile run during a shootout at the now defunct Los Angeles County Raceway one night as snow flurries fell. Though my bias toward the performance end of the motorcycling spectrum grew during this period, mostly as the result of a lot of free track time, I never forgot how great it was flog that old-school, completely relaxed 851 for a day. It was the one rebellious atom vibrating furiously in the back of my brain the whole of the time. With time things change. I am now old and creaky enough that rock hard seats, rearsets that push my knees up into my chin and really low clip on handlebars just won't do – no matter how much horsepower they are attached to. So while casting about for an old guy bike, I had to divorce myself from my beloved high-strung Japanese thoroughbreds and consider the rest of the two-wheeled spectrum. I briefly considered the new Honda VFR, a classic over the hill racer ride, but it had AARP written all over it. On that account, my understanding is that getting junk mail from AARP doesn't make you old, but opening it does. So while casting about on eBay for a street bike, something with superbike bars, a comfy seat, reasonable ergonomics and lots of torque, I came across a beautiful Monster S2R1000 located just a few hundred miles away – and the bids for it were all pretty low. A week later she was mine, and it was the beginning of a beautiful friendship. The fact that the Duc is a bit down on horsepower doesn't mean a damn thing to me because it's an absolute beauty to behold and to ride. Besides, I'm not a racer anymore – a fact that I'm finally down with. And if I'd have know that earlier that beauty is as cool as speed, it might not have taken so long.